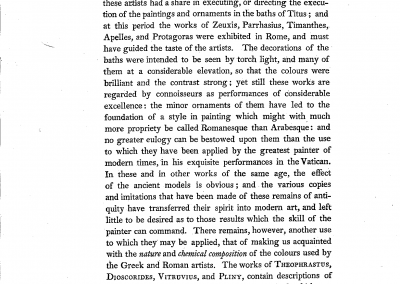 Almost 40 pigments were described by the authors of the four known treatises that have survived from the 1st centuries B.C. 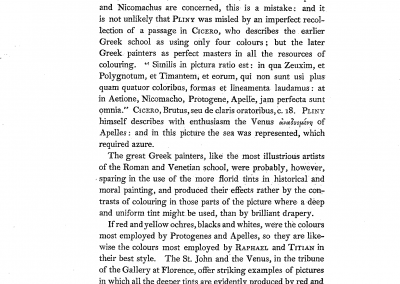 and A.D.. To them the 3rd century treatise by a pupil of Aristotle can also be added, making up all that is known about the pigments used by Greek and Roman classical painters. 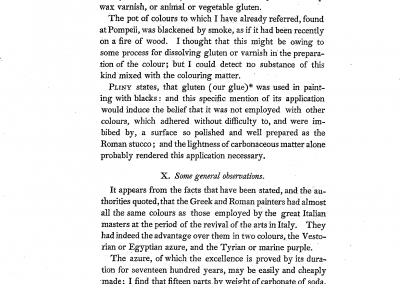 The descriptions of the pigments by Theophrastus, Vitruvius, Pliny and Dioscorides are given in full, making this little volume a complete primary source on pigments used in fresco and panel painting. 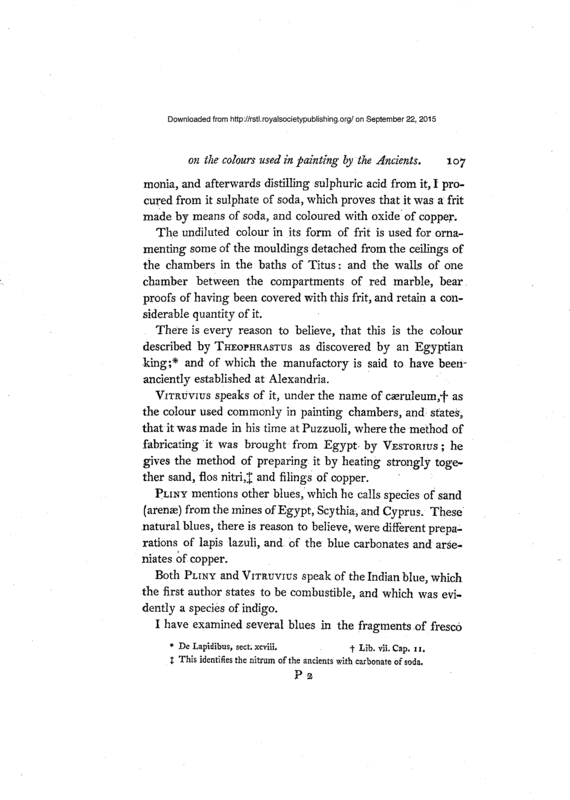 The essays by the editor discuss the two main themes in the classical texts: the principles underlying painting that were based on the capturing of form using colours and tones between light and dark, and the classification of pigments as natural and artificial, categories determined by the processing of the natural substances. These themes provided the foundations for European Renaissance painting from the 15th century, especially since the treatises by the four classical authors included in this little volume first appeared in print with the invention of the printing press c. 1440. 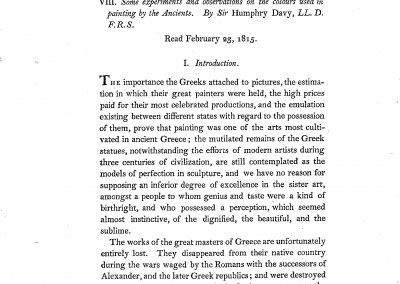 Greek and Roman Painting – Truth to Nature is to Honour Nature; Truth to Nature as Imitation. 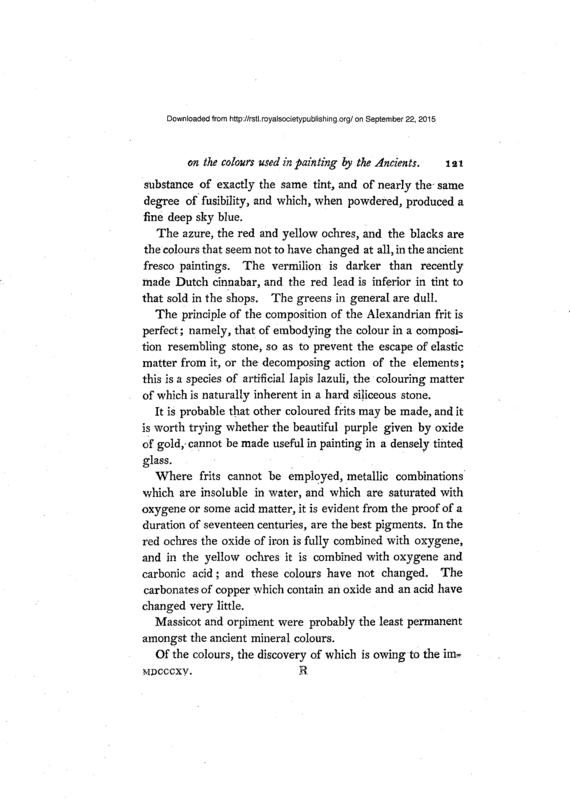 Painters’ Pigments – 1. 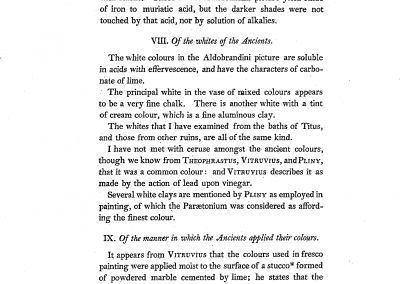 The Basic Pigments Classified by Colour 2. Natural and Artificial Pigments 3. 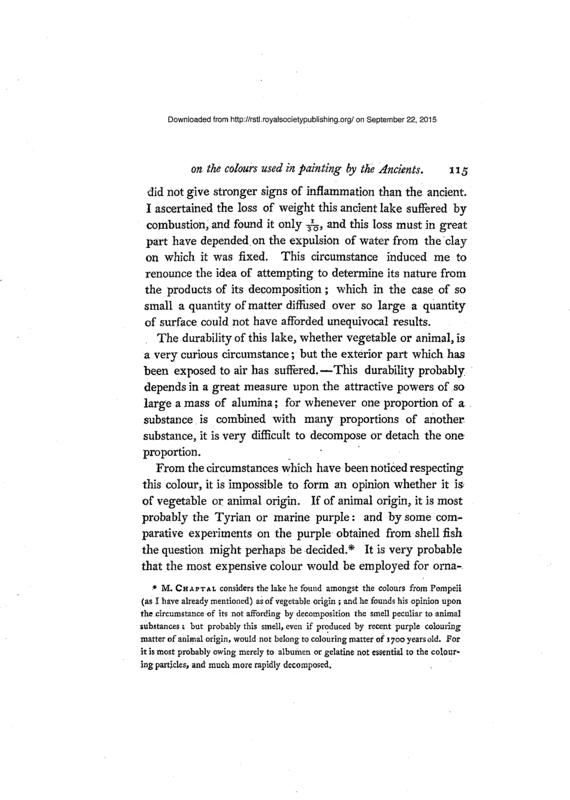 The Monochrome and the Four-Colour Palette 4. The Colourful Palette 5. 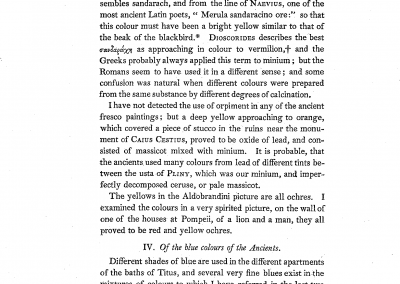 Fresco Pigments 6. Gessoed Wood Panel and Encaustic Pigments. 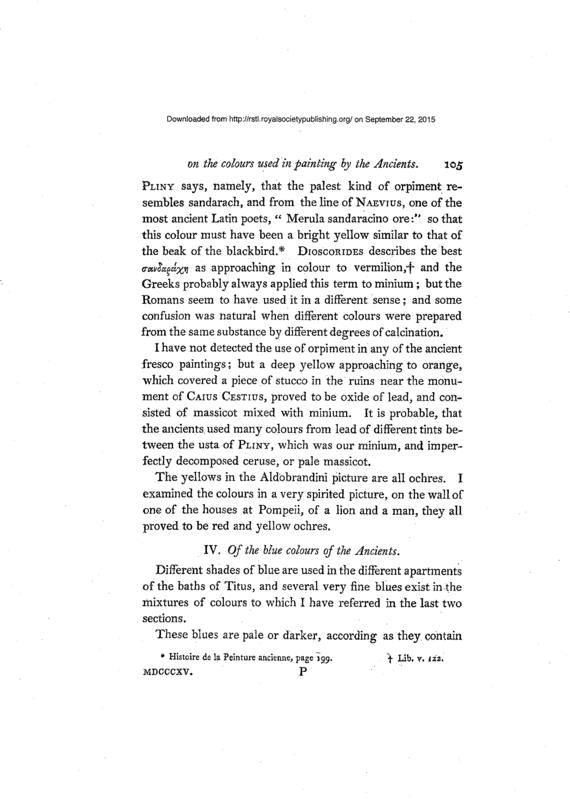 Marco Vitruvius Pollio. 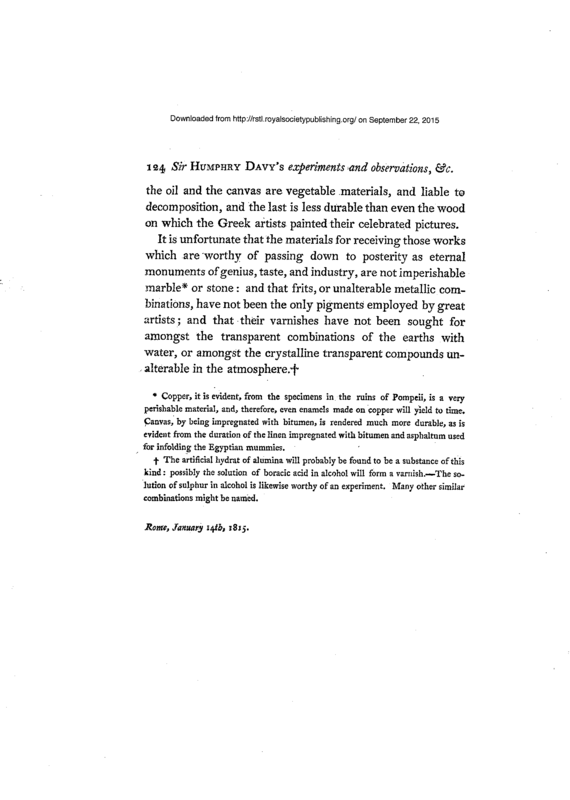 Vitruvius, The Ten Books on Architecture. Manuscript, c. 1480. 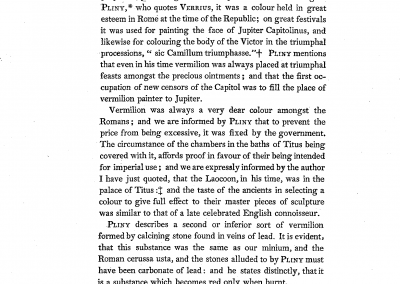 Pliny the Elder, The Historie of the World, London, 1601. 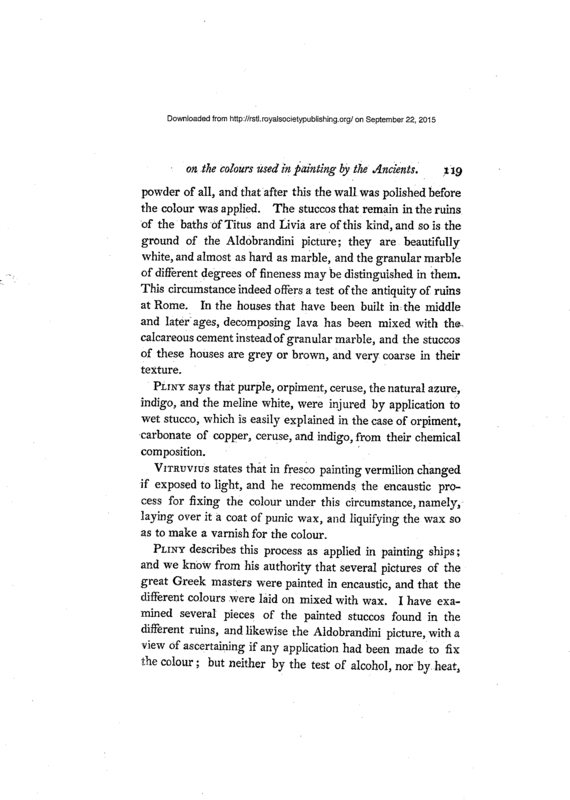 Pliny the Elder, 1st printed edition, 1469. 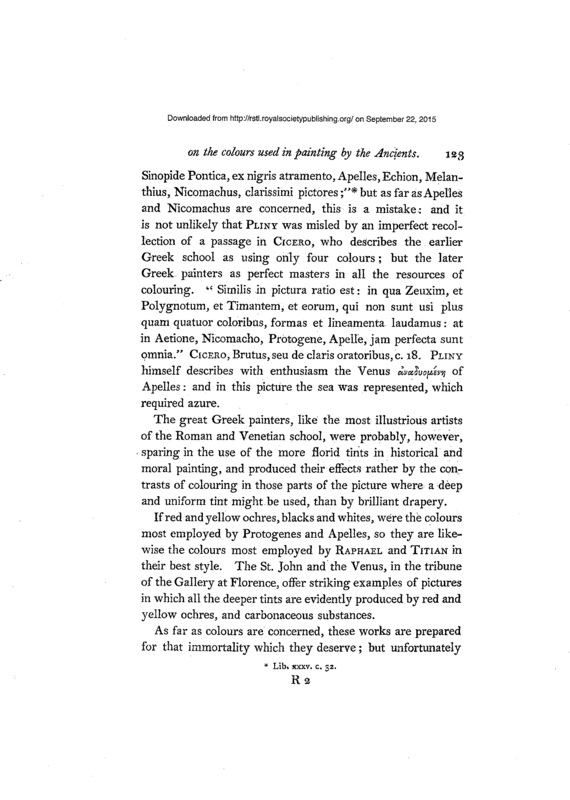 Theophrastus, On Stones, printed edition of 1578. 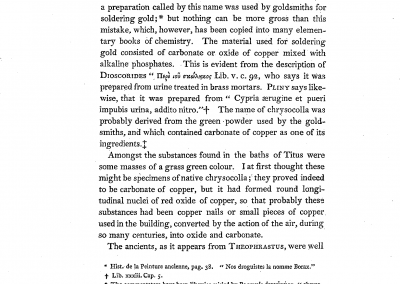 Dioscorides, Miniature from manuscript of Botany, c. 500 A.D.
White Earths – Natural, Mineral. 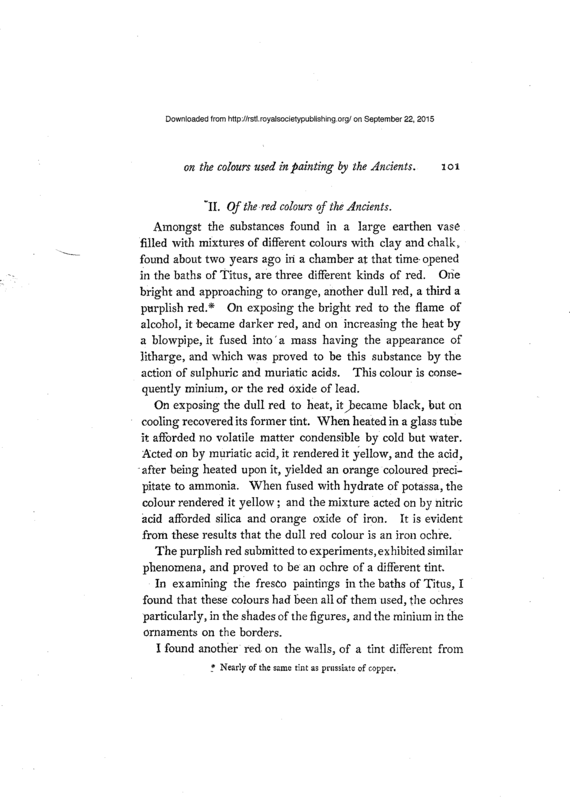 Yellow Ochre, Imitation – Artificial, plant. 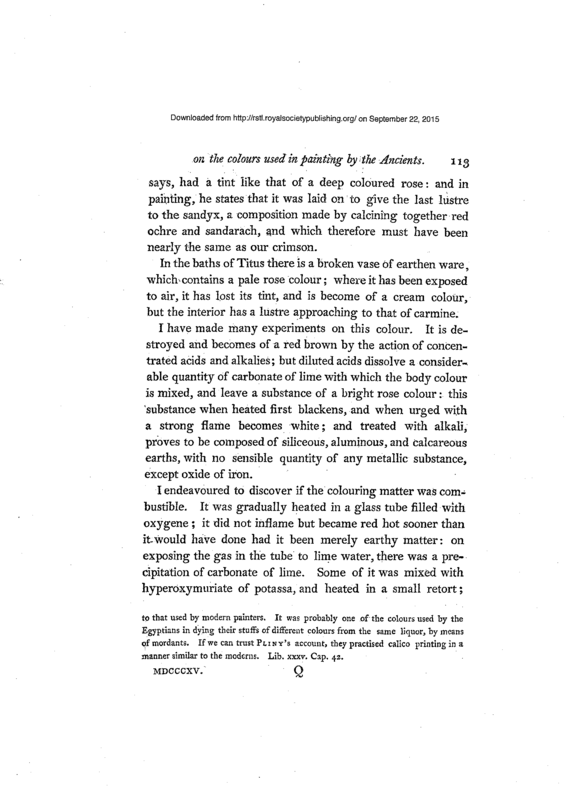 Litharge, Monoxide of lead – Artificial. Dragon’s blood / Cinnabaris – Natural. Kermes, Coccus – Artificial, animal. 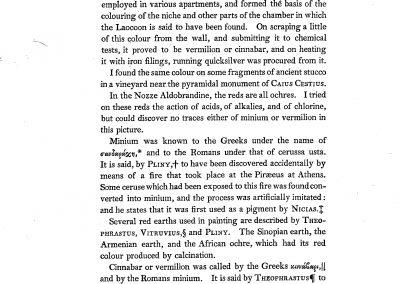 Minium secondarius as Red lead. 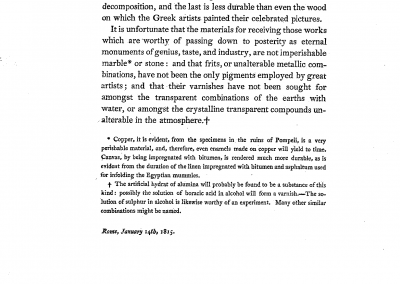 Realgar, Sandarach – Natural, Mineral. 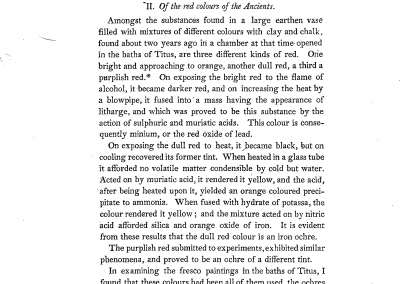 Realgar, Sandarach as Red Lead – Artificial. 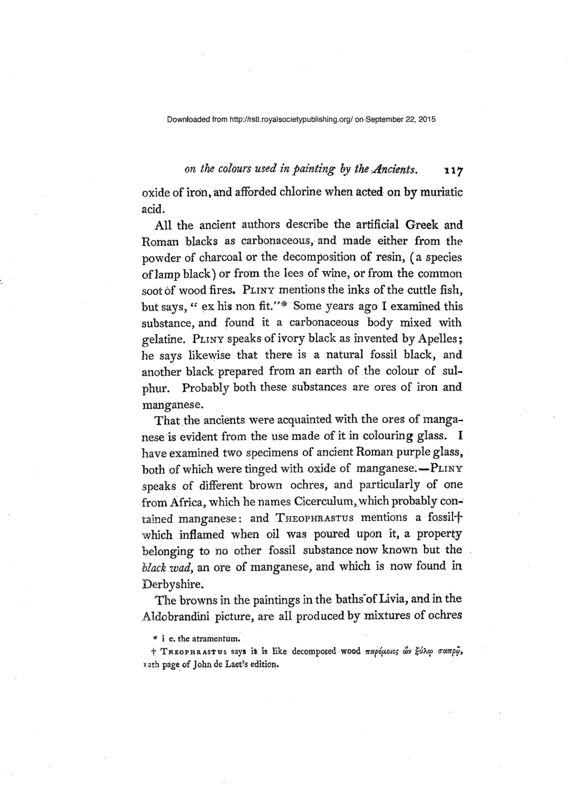 Red earths, ochres – Natural, Mineral. 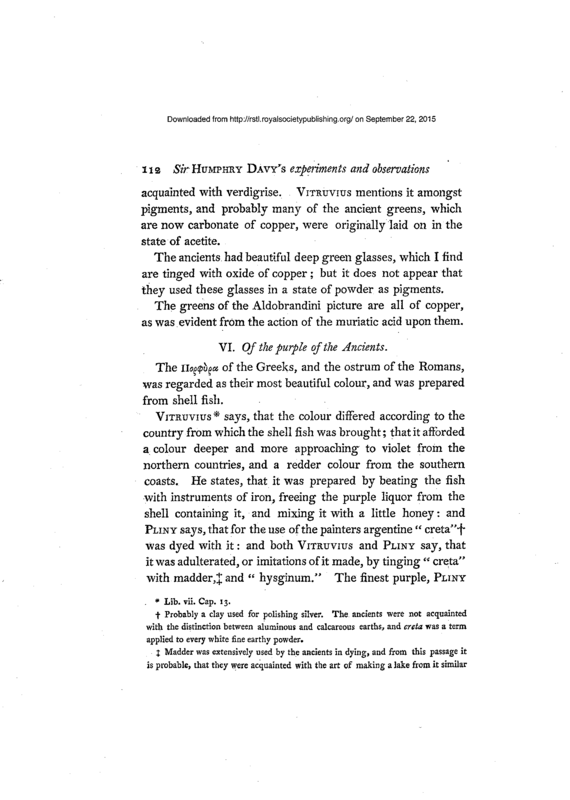 Burnt Red Ochre – Artificial. Red Lead, Sandarach, Minium Secondarius – Artificial. Manufactured. Green earth / Terre verte – Natural, Mineral. Cyanus, Kyanos – Blue, Natural. 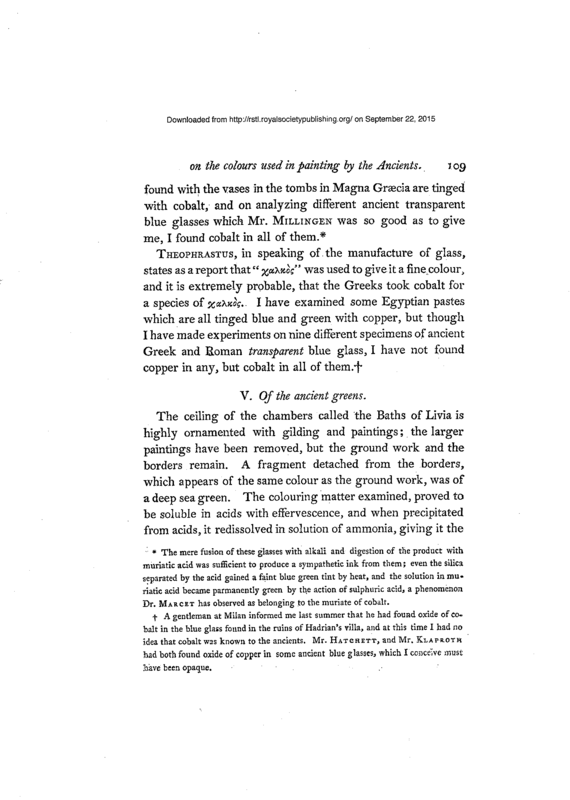 Egyptian blue – Artificial, Manufactured. Woad, Isatis tinctoria, glastum. Artificial, plant. 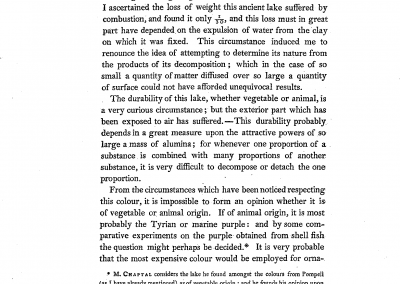 Purple dyes from shellfish of the family – Artificial, animal. Murex and whelks, Buccinum undatum. 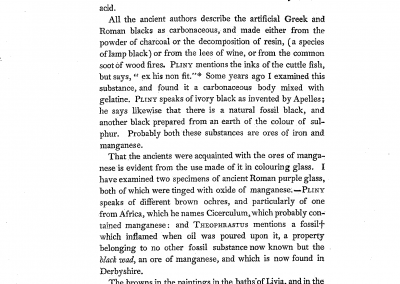 The Black Pigments – Artificial, Plant. 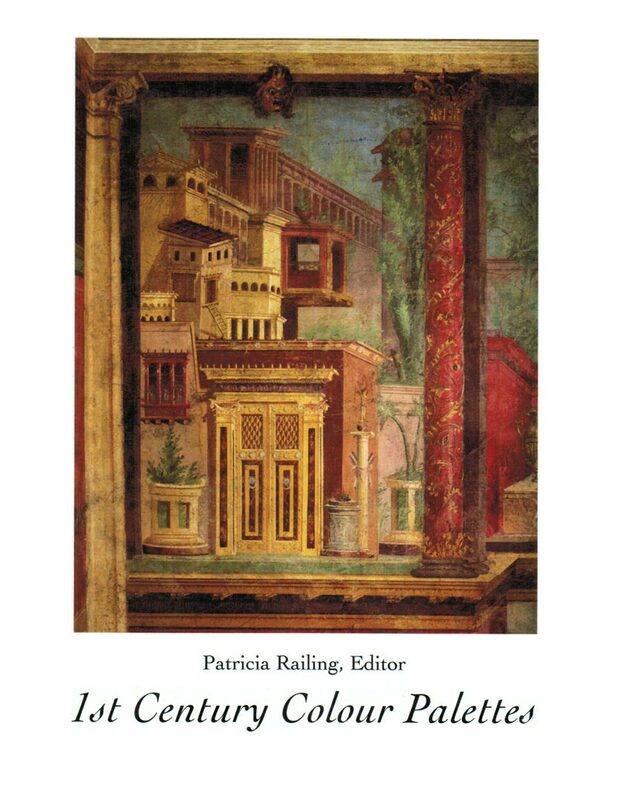 The excavations of Pompeii and Herculaneum in the 18th century afforded not only the discovery of architecture, sculpture and painting, but also the pigments used to create the paintings, most of which were fresco wall paintings. 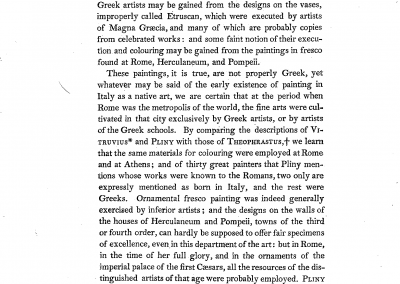 For pots of pigments from shops were unearthed and even found in corners of houses where painting was perhaps being carried out at the time of the eruption of Mt. 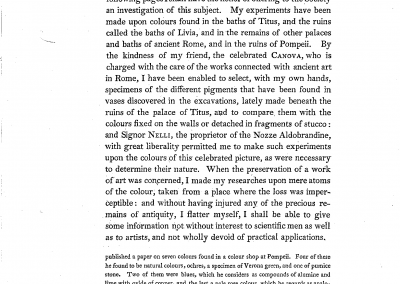 Vesuvius on 24-25 August 79 A.D..
Eighteenth century scientists were very much the companions of the archaeologists who were carrying out the excavations. 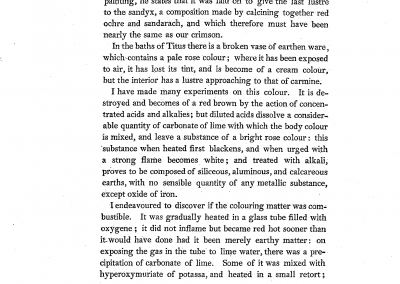 The first comprehensive article, it would seem, reporting on the pigments found at the sites was published in London in Philosophical Transactions of January 1815, written by the highly respected English chemist, Sir Humphrey Davy (1778-1829). It is printed here in full. 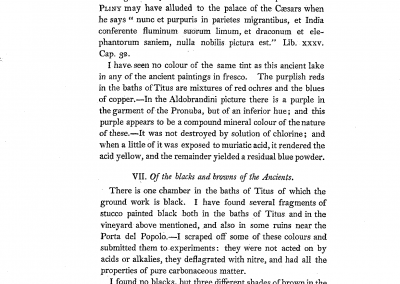 Davy’s article is important above all because his analysis of the pigments found in pots and in situ specimens taken from wall paintings coincide with those given by Vitruvius and Pliny in their texts. 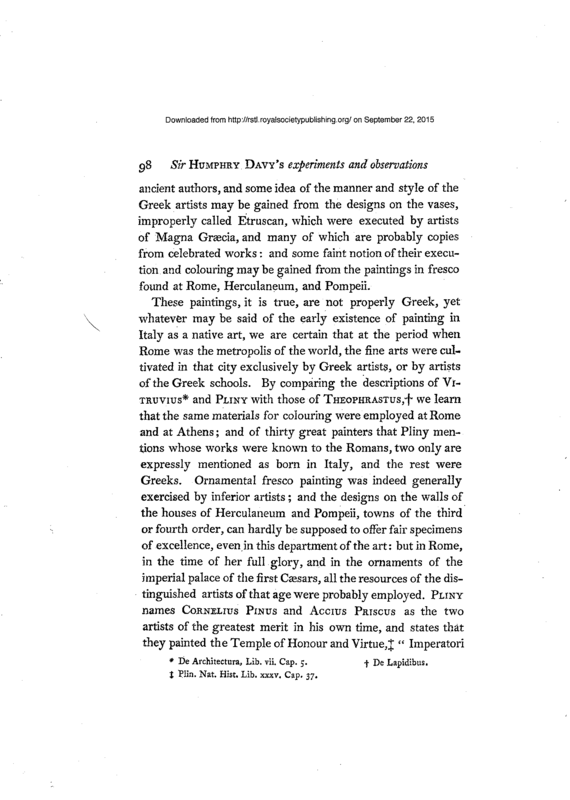 Evidence has confirmed the documents, while information on the mixing of pigments, mentioned only in passing in the 1st century texts, is contributed by Davy’s findings. 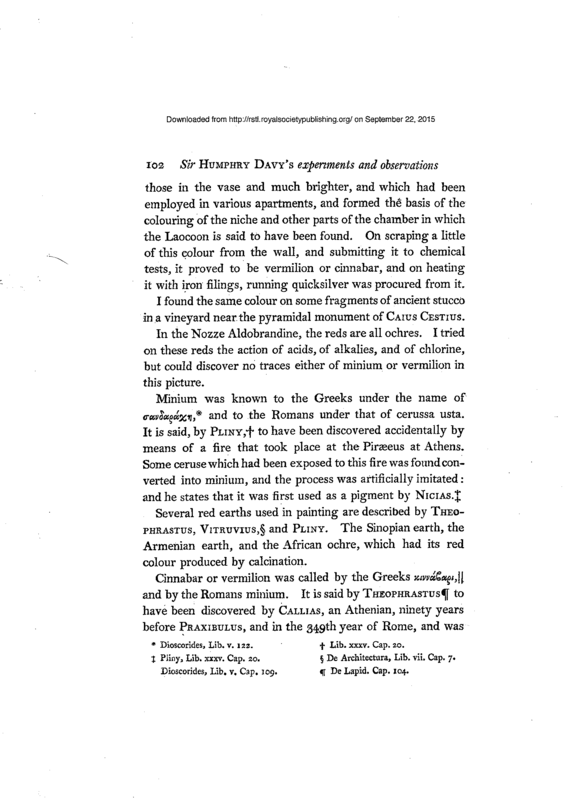 His article, then, is a fitting complement to a compilation of pigments used in classical Rome and, by extension, Greece – where the same pigments have been found – especially as he, too, places his investigation in the context of the same four authors whose writings are the basis of this little book. How satisfying it is when a line traced comes full circle, the picture complete. 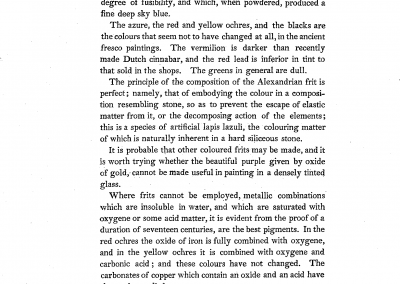 Reds – red lead, red ochre, cinnabar, burnt ochre, realgar. 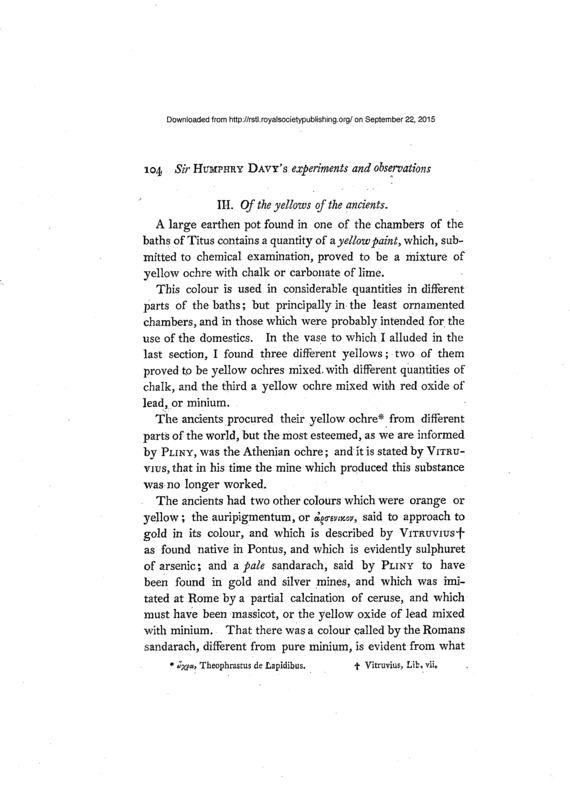 Yellows – yellow ochres, orpiment, yellow lead. 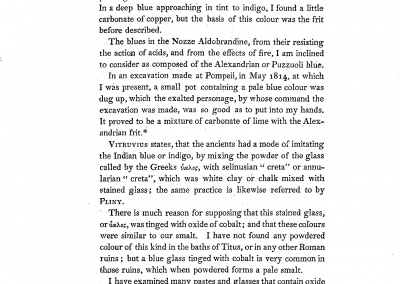 Blues – blue frit: Alexandrian/Egyptian blue, azurite, indigo. 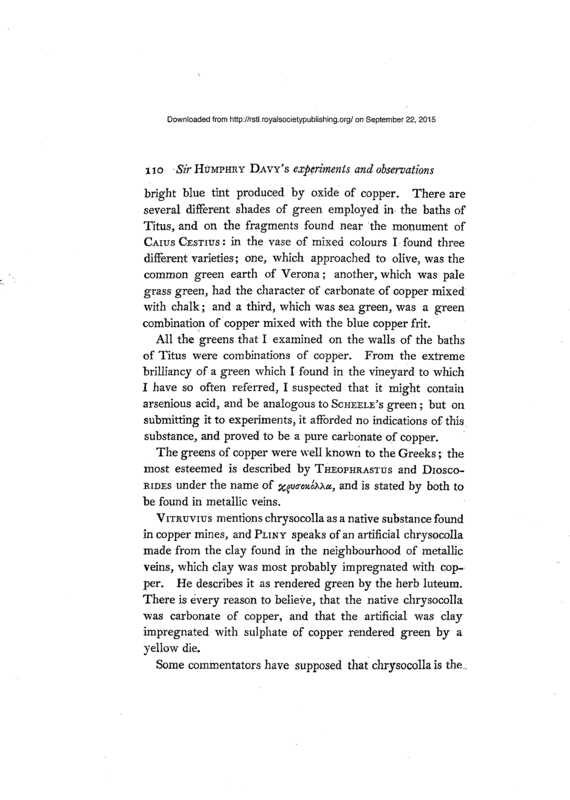 Greens – terre verte/green earth, malachite, verdigris. 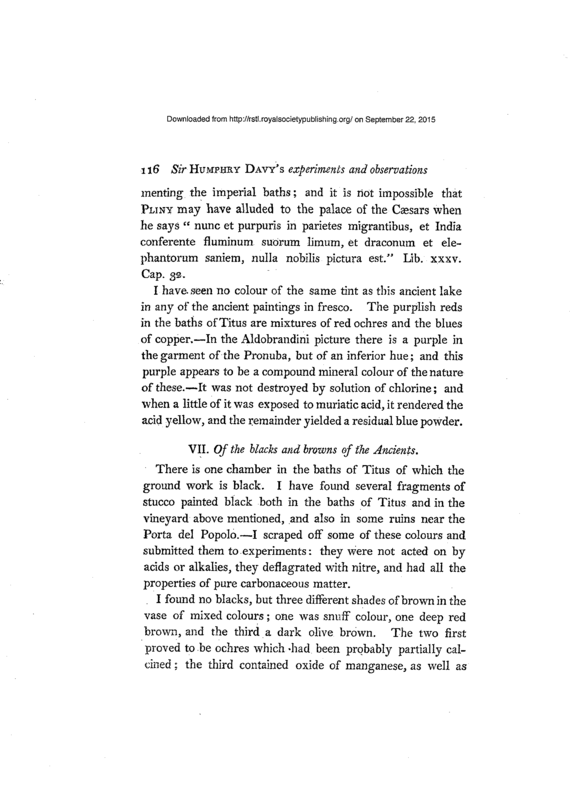 Purples – murex or kermes, possibly, madder. 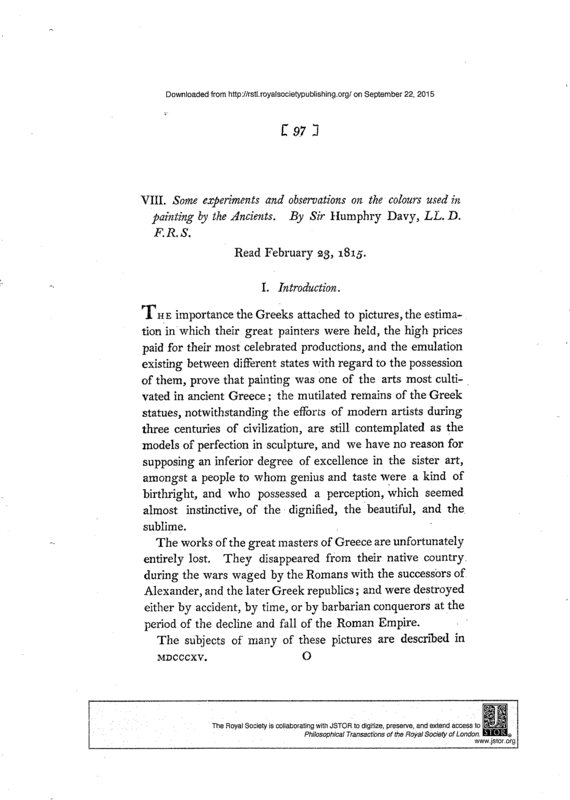 Downloaded from Philosophical Transactions, 1 January 1815, No. 105, 97-105. London. 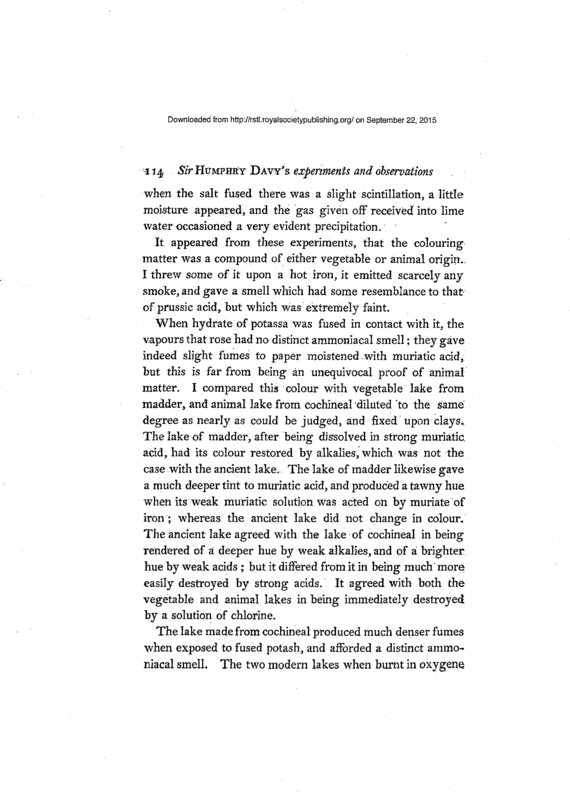 By courtesy of Royal Society Publishing.org. Red ochre. 2. Red earths are found in abundance in many places, but the best in only a few, for instance at Sinope in Pontus, in Egypt, in the Balearic islands of Spain, as well as in Lemnos. 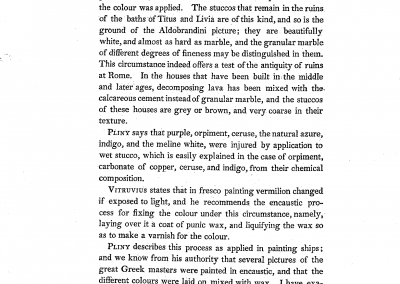 Vitruvius. The best rubrica Sinopica is thick and heavy, with a bright colour, without stones, and all one colour, spreading out much when dissolved. It is gathered in Cappadocia from certain hollows. It is purified, carried to the city Sinope (from which it has its name) and sold. 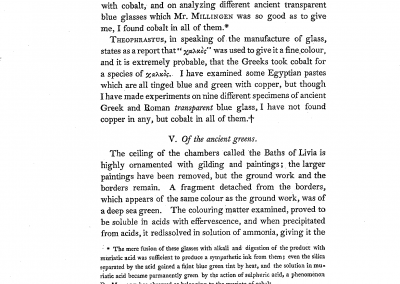 Dioscorides. 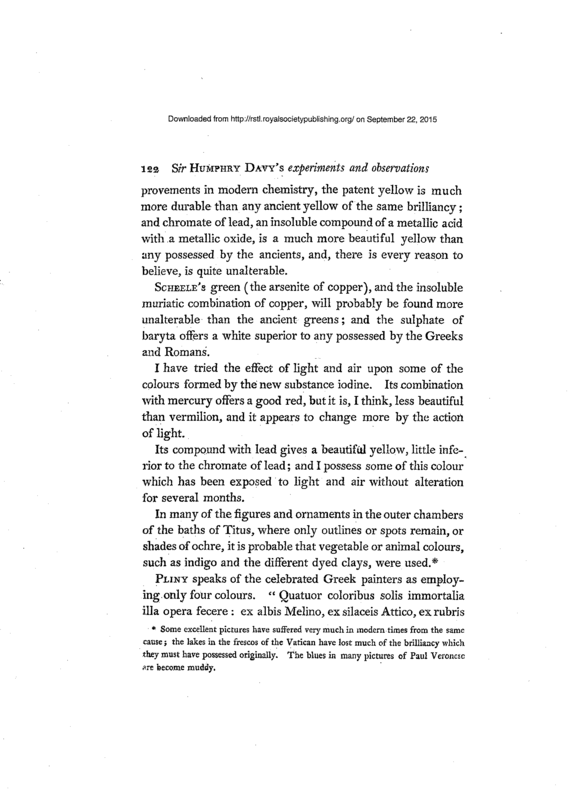 Yellow ochre. 51. 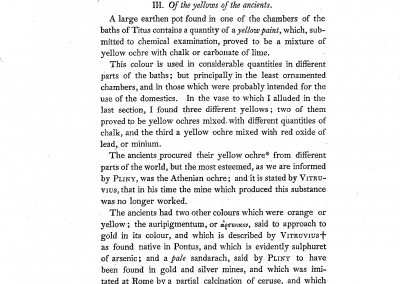 Yellow ochre is “found in silver and gold mines…. 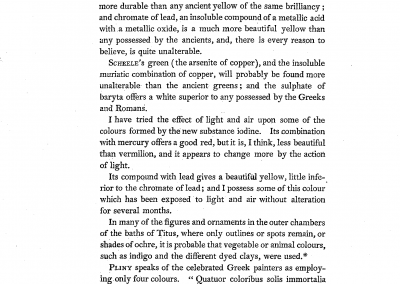 And yellow ochre can take the place of orpiment, since there is no real difference in their colour, though there seems to be. 52. But in some places there are mines that even contain both red ochre and yellow ochre together, as for example in Cappadocia, and large quanti–ties are dug up. Theophrastus. Green earth. 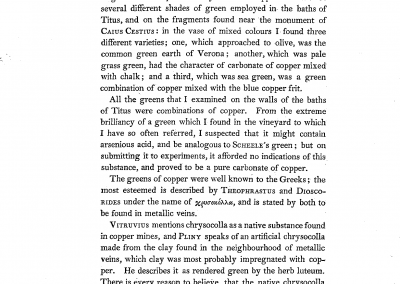 There are also two colours of a very cheap class that have been recently discovered: one is the green called Appian which counterfeits malachite [chrysocolla]; just as if there were too few spurious varieties of it already! It is made from a green earth and is valued at a sesterce per pound. 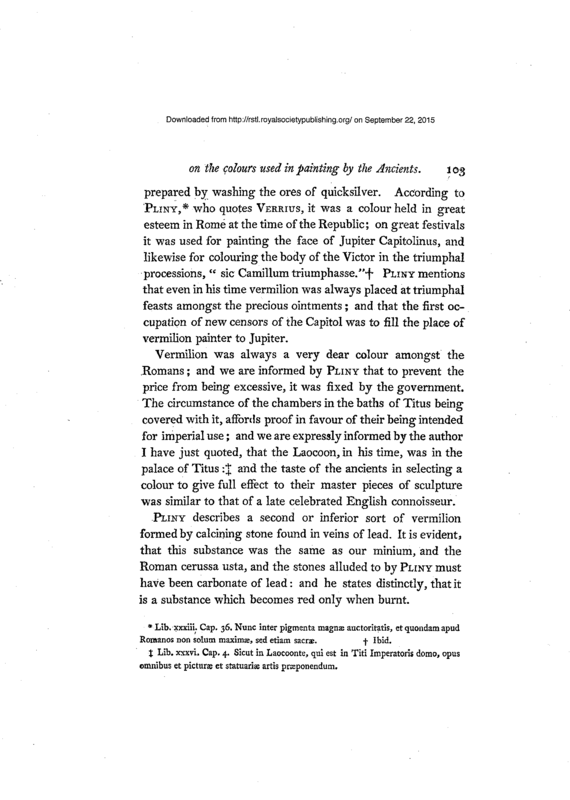 Pliny. Egyptian blue. 1. 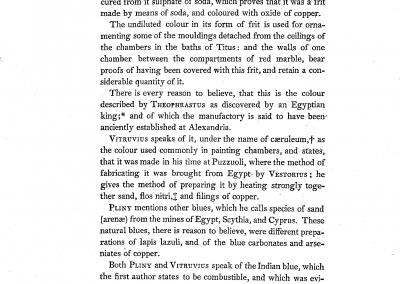 Methods of making blue were first discovered in Alexandria, and afterwards Vestorius set up the making of it at Pozzuoli. The method of obtaining it from the substances of which it has been found to consist, is strange enough. 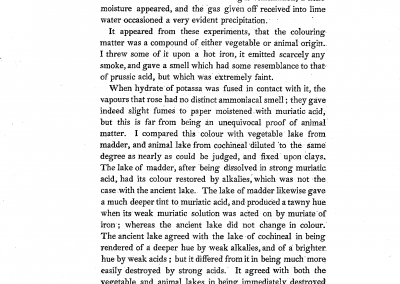 Sand and the flowers of natron [nitric acid, aqua fortis] are brayed together so finely that the product is like meal, and copper is grated by means of coarse files over the mixture, like sawdust, to form a conglomerate. Then it is made into balls by rolling it in the hands and thus bound together for drying. The dry balls are put into an earthen jar, and the jars in an oven. As soon as the cooper and the sand grow hot and unite under the intensity of the fire, they mutually receive each other’s sweat, relinquishing their peculiar qualities, and having lost their properties through the intensity of the fire, they are reduced to a blue colour. 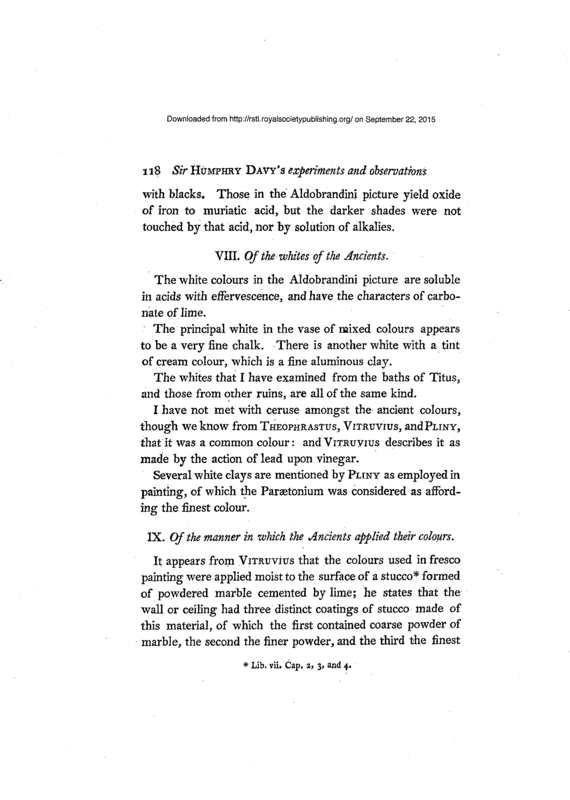 Vitruvius. Cinnabar. 1. 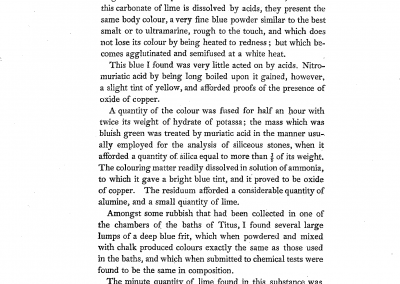 I will now return to the preparation of cinnabar pigment. When the lumps of ore are dry, they are crushed in iron mortars, and repeatedly washed and heated until the impurities are gone, and the colours come. When the cinnabar has given up its quicksilver, and thus lost the natural virtues that it previously had, it becomes soft in quality and its powers are feeble. 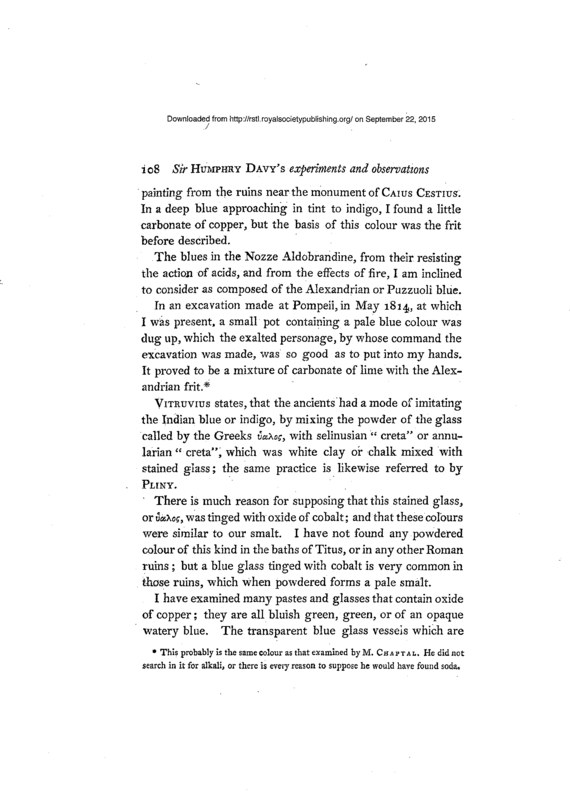 It is ground into a pigment. Vitruvius. 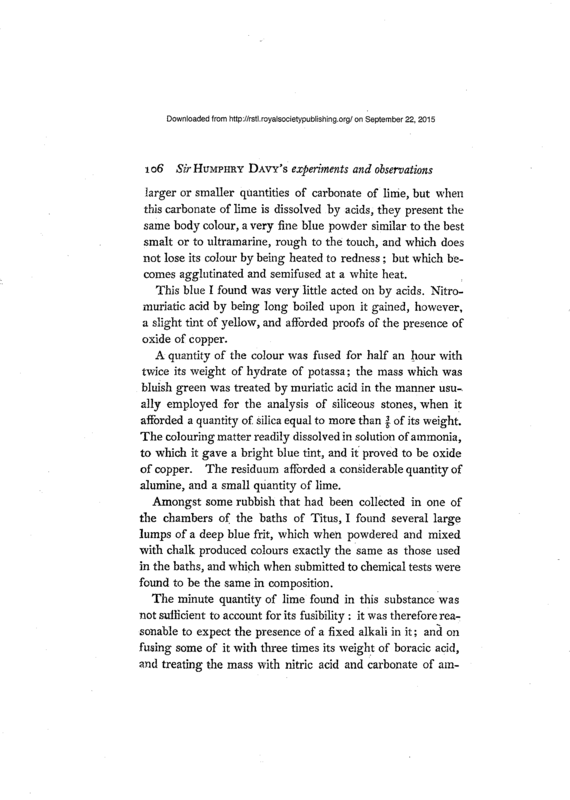 Orpiment. 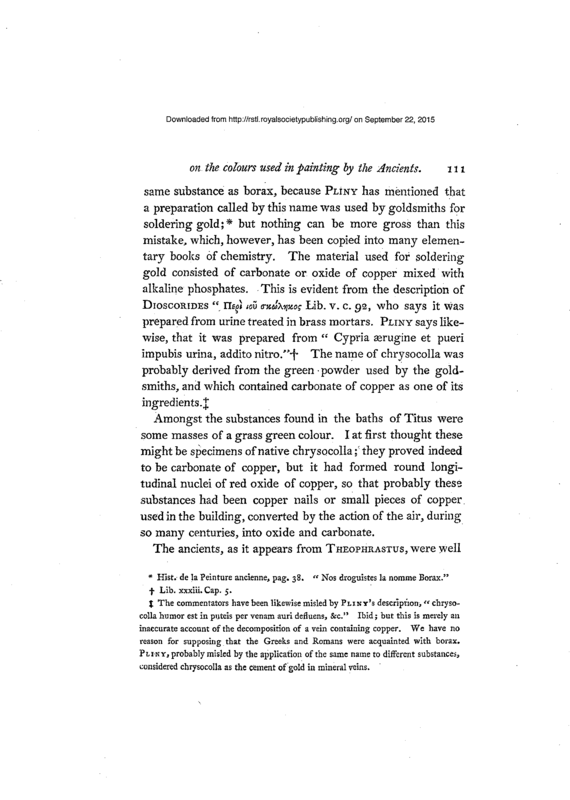 Arsenicum is found in the same mines as sandaracha [realgar] [5-122]. The best is crusty, gold in colour and with crusts like fish scales (as it were) lying one over another, and it is not mixed with any other material. That which is found in Mysia (which is in Hellespont) is like this. There are two kinds: one as mentioned, and the other in clumps and like sandaracha in colour. It is brought from Pontus and Cappadocia. It is roasted as follows: place it in a new ceramic jar, set it over burning coals and stir it continuously; and when it is red-hot and has changed colour, cool it, beat it finely, and put it in jars. 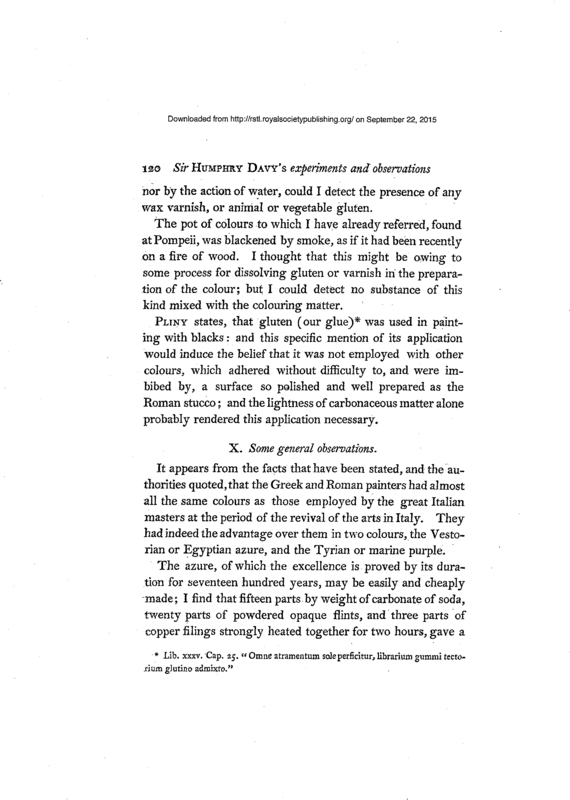 Dioscorides. Malachite. 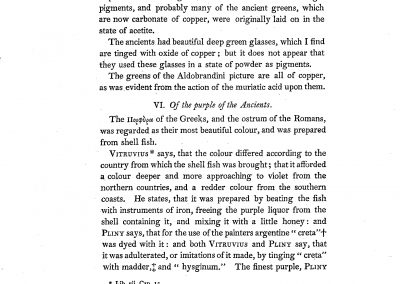 Malachite [chrysocolla] from Armenia is the best – considerably resembling leeks in colour; that from Macedonia is the second, then the Cyprian. The pure should be chosen, but that which is full of earth and stones must be refused. It is washed as follows: pound it, put it into a mortar, pour on water, and rub it strongly with the palm of your hand against the mortar. Allow it to settle, strain it, pour on other water, rub it again, and do this repeatedly until it is pure and unadul–terated. Then dry it in the sun and put it in jars and use it. 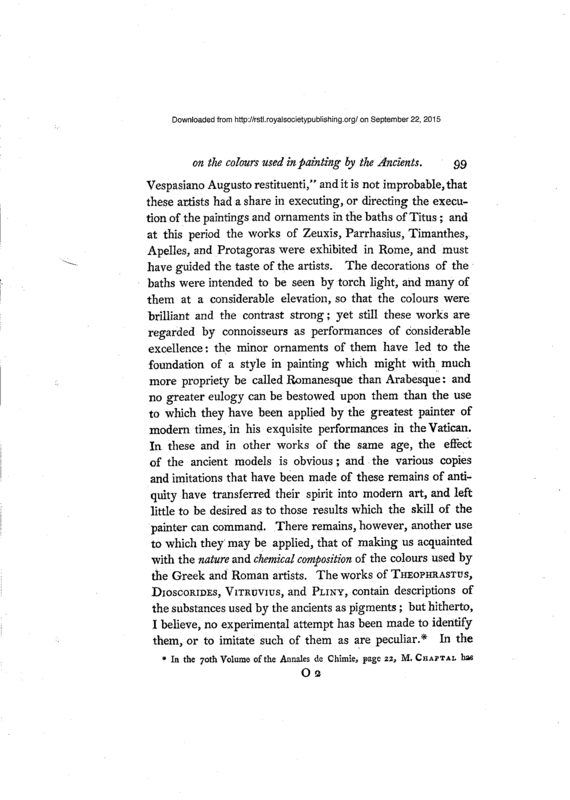 Dioscorides. Azurite. Armenia sends us the sub–stance named after it: Armenium. This also is a mineral that is dyed like malachite [chrysocolla], and the best is that which most closely approximates to that sub–stance, the colour partaking also of dark blue. 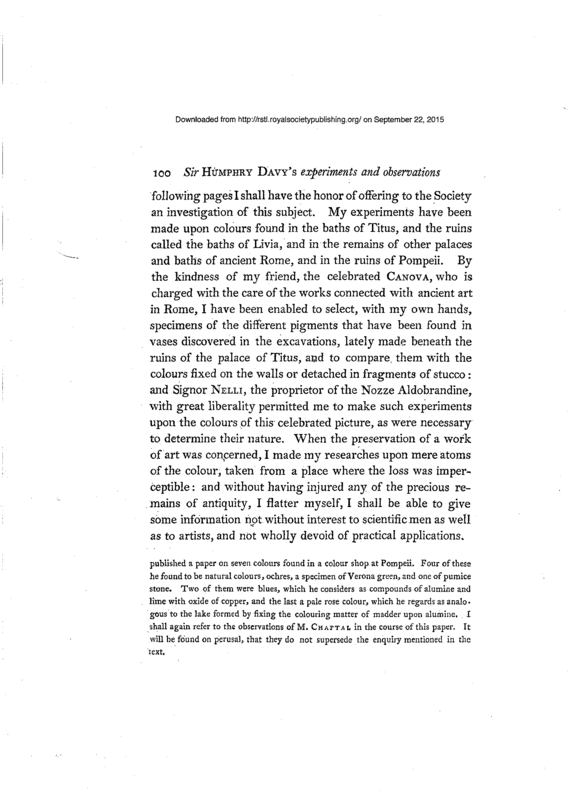 Pliny.